Riveting account of a journey home, a family crisis, and a spiritual search. Memoirist Beck (Expecting Adam, 1998, etc.) returns to Mormon-land with her husband and two small children. Her younger child was born with Down syndrome, and the Becks decided that their hometown in Utah would offer a better environment for raising young Adam than the cutthroat world of Harvard Square (where everyone had pressed the Becks to abort as soon as the amnio results were in). Indeed, they are welcomed with open arms, shiny smiles, and many casseroles, and both Becks find posts at Brigham Young University, that bastion of Latter-day Saint higher education. But it’s a rough time to be at BYU, since the church hierarchies are weeding out intellectual Mormon dissidents. (Beck is instructed to teach “Sociology of Gender” without using the word “feminism.”) Beck watches in horror as the church’s crackdown culminates in the trials of the famous September Six, LDS scholars tried for heresy (five were excommunicated). Despite all the neighborly support, Beck is plagued with inexplicable pain, nightmares, and, ultimately, previously repressed memories of childhood sexual abuse by her father, a prominent Mormon apologist. Finally, deciding they can’t stay in Utah, the family leaves both the state and the church. But Beck remains ardently spiritual, finding faith in a generous God who, she knows, loves her even more than she loves her own children. Her sarcastic self-scrutiny and laugh-out-loud prose elevate her story far above the run-of-the-mill dysfunctional family memoir. 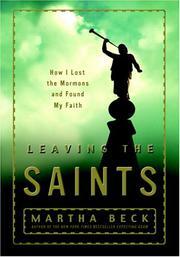 And though Beck is critical of the LDS Church—its attempts to cover-up sexual assaults in Mormon homes, its refusal to deal with historical and archaeological finds that challenge orthodox doctrine—this is not a trashy exposé but a loving, sad account of coming home again, however sure it is to spark controversy in the corridors of power in Salt Lake City. Set aside an evening when you won’t be interrupted, lay in boxes of Kleenex, and give yourself to a gripping memoir.